Does anyone else feel like this year is going by really quickly, already? I feel as if January flew by. It seems it was just yesterday that I was putting up the Christmas tree. Where does the time go? By the rate of this winter, we won't have any sledding snow! My kids are so disappointed. I am too, to be honest. Everyone thinks I am crazy for wanting snow! Yes, the shoveling and the roads become a little tedious after a while. But, I feel as if those night time, or afternoon sledding adventures with the kids, makes the shoveling, frost heaves and yucky roads worth it. So, I had my first go at baked donuts with the apple cider donuts. Those were a huge hit. Since chocolate is my husband's favorite, I knew I had to give those a try as well! I am not usually a chocolate fan, and I try to not eat donuts that much. I just feel like donuts are a little excessive, even for me. With all that said, I rather enjoy the baked donuts. 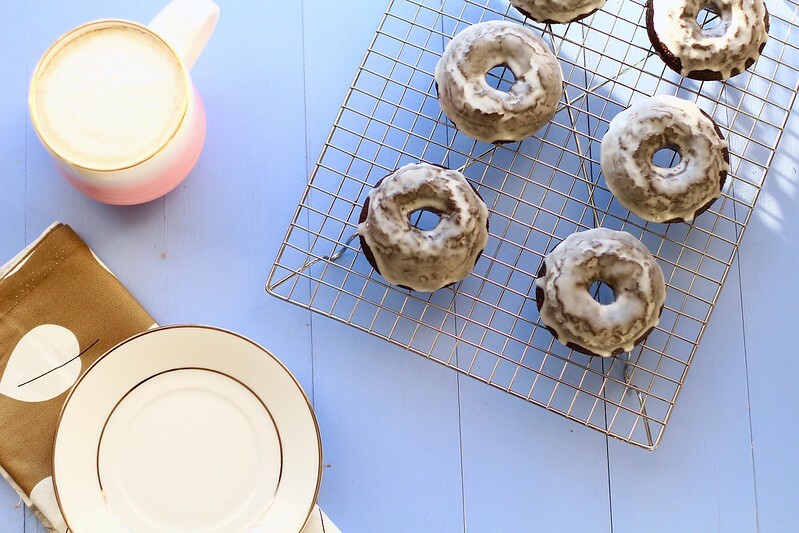 They are more cake-like, but still delicious, without the sugar and fat-laden fried donuts bring you. 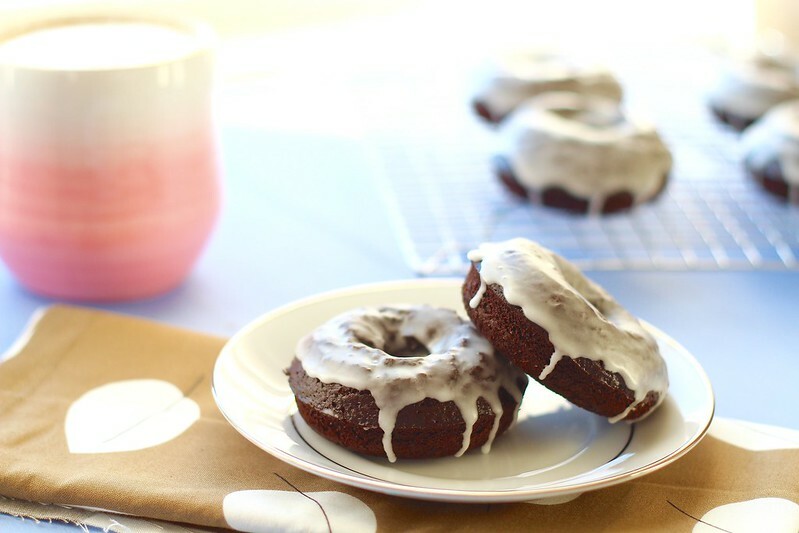 The chocolate donuts have been my husband's favorite so far. They didn't last long in our house. The kids thoroughly enjoyed them as well. 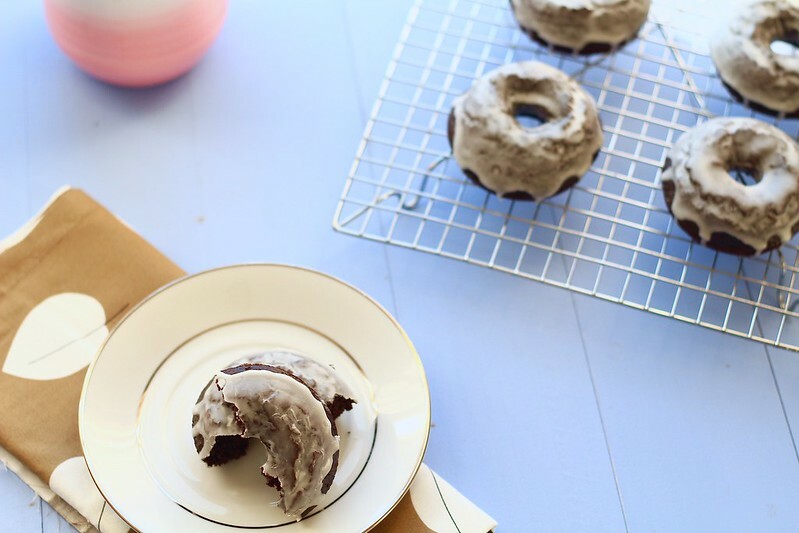 The glaze brings just the right amount of sweetness to the donut without being an over kill. 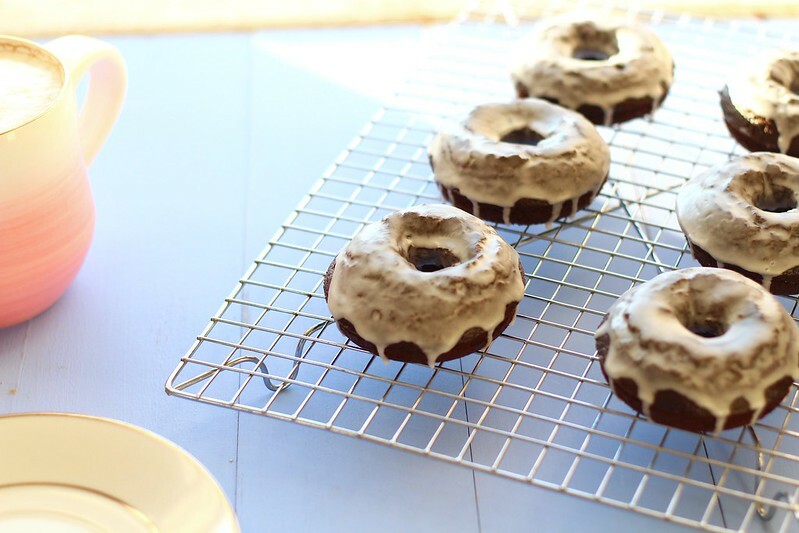 Since these are baked and not fried, they are something I plan on making again and again. Preheat oven to 400ºF. Grease a 6-donut pan. In a small bowl, whisk together the milk and vinegar. Allow to sit for about 5 minutes. Melt butter in a small bowl and set aside to cool. Meanwhile, whisk together the flour, cocoa, baking soda, sea salt, and nutmeg in a large bowl. Set aside. Whisk in sugar, honey, and egg into the cooled butter until evenly combined. Whisk in curdled milk. Whisk together the milk mixture with the flour mixture until just combined. Add the batter to a piping bag and pipe evenly into the pan, about 2/3 full. 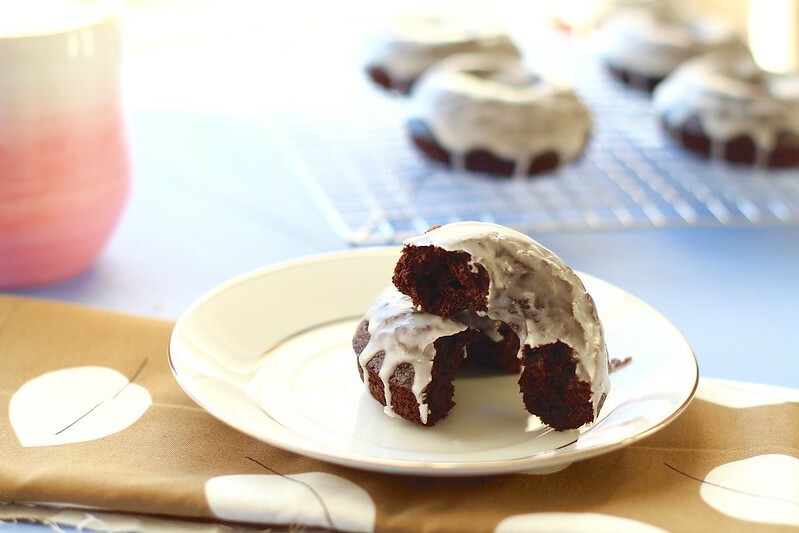 If you have any batter left over, make donut "holes" in a mini muffin pan. Meanwhile, make glaze. In a small bowl, whisk together the half and half and powdered sugar until smooth. 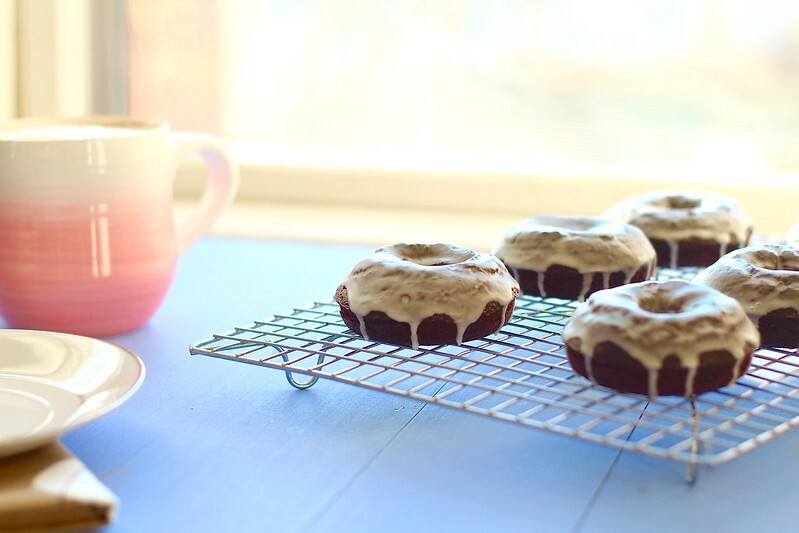 Once the donuts have cooled completely, dip in the glaze. Place on cooling rack to allow the glaze to set.